Created for those allergy and asthma sufferers who struggle to find relief. Treats up to 1500 square feet. 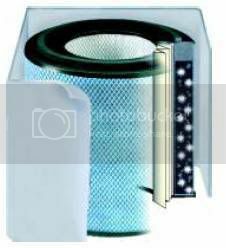 HEGA filter containing Activated Military Carbon Cloth and over 60 sq ft of True Medical Grade HEPA. Developed by the British military for use against chemical warfare, Austin is the only air cleaner manufacturer to use HEGA High Efficiency Gas Absorption) in their cleaners. The Austin Air Allergy Machine cleans up to 1500 square feet, with strategically placed military carbon cloth and True Medical HEPA filter media. Created for those allergy and asthma sufferers who struggle to find relief, the Allergy Machine™ is the only air cleaner on the market to incorporate HEGA filtration. The Allergy Machine™ features High Efficiency Gas Absorption, removing contaminants out of the air before they get a chance to irritate and trigger your asthma or allergies. If the Allergy Machine™ doesn't change your life and improve your sleep, return it for a refund within 30 days. The Allergy Machine™ provides a comprehensive air cleaning solution, removing allergens, asthma irritants, sub-micron particles, chemicals and noxious gases. Every minute, The Allergy Machine™ draws over 250 cubic feet of air through a 4-stage HEGA filter containing Activated Military Carbon Cloth and over 60 square feet of True Medical Grade HEPA. The result... more clean air delivered faster and more efficiently than any other air cleaner on the market. Backed by the best warranty in the industry, you can take pleasure in knowing you’ve made a sound investment with your Austin Air cleaner. In the unlikely event that you're not completely satisfied with your Austin Air cleaner, return it within 30-days, no-questions-asked. Your Austin Air cleaner is warranted to be free from defects in material and workmanship for a period of 5-years from the date of purchase; provided your Austin air cleaner was operated under normal residential use and that you have completed and returned your warranty registration to Austin Air Systems. Austin Air offers a 5-year pro-rated filter warranty, by far the most comprehensive in the industry. No more costly filter replacements every few months or even years. Austin Air filters are designed to last for an amazing 5-years, under normal residential use. 400cfm on high setting: cleans a room area up to 1500 sq. ft.
© , HealthyHomeFilterCo.com. All Rights Reserved.